This past weekend over 800 women, and a few men, converged at Ridgecrest for Missions Extravaganza. What a weekend! As I met with folks, led conferences, and spoke, I had this amazing sense of AWE that the Lord would allow me to be part of this. And then, Roger and Rose Ann Childres, missionaries in Botswana, spoke. Through them, God answered my question. I am chosen and appointed by God to bear fruit that will last. And, if you know Jesus, then you too are chosen and appointed by God as well for something AMAZING! How awesome is that? God chose us in love. God appoints us in love. “For by grace you have been saved through faith. And this is not your own doing; it is the gift of God, not a result of works, so that no one may boast. For we are his workmanship, created in Christ Jesus for good works, which God prepared in advance for us.” Ephesians 2:8-10. As we choose to live in the love of Jesus, he will show us what he has appointed for us. And when we respond in love to his call, we will have the joy of partnering with him to advance his Kingdom on the earth. Join me? I am chosen and appointed by God for something AMAZING. And so are you! Do you have a sense of being chosen by God? Appointed by God? Are you praying that God will position you to bear fruit that will last? I’d love to pray for you. Leave me a comment, connect with me on Facebook, or email me at cynthiafin@gmail.com. How many Finleys can fit into a phone booth? Over Spring Break we took the family to Busch Gardens for a couple of days. On the way out of the park we almost crammed into this phone booth for a quick picture, but one was missing. We took this picture to send to Grace, to tell her she was missed. But I’m guessing, for her, it brought sadness as well as joy at the silliness of her family. It did for me too. One was missing. When one is missing from the dinner table, from birthday celebrations, from beach trips … it’s sad. Our one missing is in college, healthy, happy, busy. I’m well aware that my missing her in no way compares to the grief of the Richard family, or the Campbell family, or others who are suffering great, great loss. It is no hard thing to consider Monday and feel horrified, and angry, and so very, very sad. It’s not a hard thing to celebrate the beauty of rescuers and heroes and the people of Boston who are going shoulder-to-shoulder. It’s not a hard thing to hold your babies close and even weep as you think about the pain and the loss and the fear. What’s harder is knowing what to do with all of this grief. When one is missing. I’m a Christian. For me, this means that I trust in Jesus Christ. I live for him. I live for his glory, with skinned knees, scraped elbows, and so many questions. I live for him. Years ago I made a decision to orient my life around Jesus, rather than myself. In doing so I have gained joy, freedom, and the confidence of knowing that there will be a Day when there is no more hunger, no more thirst, no more orphans, for goodness’ sake, no more tears, no more fears … A Day when all is made right. Oh, I long for this Day. In the days of one is missing, I long for this Day. As a Christian, I turn to God with my questions, even the really hard ones. He doesn’t always answer them, but he comforts me and gives me hope, a hope that will never disappoint. If you’re wondering what to do with all this grief, I’d like to suggest that you join me in turning to God. Here’s how. Don’t run from the mourning too quickly. Don’t pretend it’s okay. Death and destruction are the work of the enemy. Grief and anger are an appropriate response. God is strong enough and compassionate enough to receive you in your grief. Grieve with God. 2. Grieve with God’s people. Not the ones who are quoting Romans 8:28 to you, but the ones who know the Father of Mercies. The ones who have experienced loss, pain, failure and found God to be a comfort. These are the ones who are especially equipped to come alongside you in your pain. Blessed be the God and Father of our Lord Jesus Christ, the Father of mercies and God of all comfort, who comforts us in all our affliction, so that we may be able to comfort those who are in any affliction, with the comfort with which we ourselves are comforted by God. 2 Corinthians 1:3-4. For Christians, we have hope beyond the grave. This is the foundation of our faith. If there was no resurrection, for Jesus or for us, there would be no basis for our faith in Jesus Christ. In grief, look beyond the pain of this very terrible “now” to the “not yet” that is surely coming. We do not want you to be uninformed, brothers and sisters, about those who are asleep, that you may not grieve as others do who have no hope. For since we believe that Jesus died and rose again, even so, through Jesus, God will bring with him those who have fallen asleep. 1 Thessalonians 4:13-14. When one is missing, the grief goes deep. Even if you weren’t at the finish line on Monday, you either have been grieving, you are grieving, or you will be grieving. Grief and suffering are part of this shattered world. Perhaps this word is for you in your grief today. Or perhaps it is to be a word encouraging you to come alongside someone else who is grieving. Be ones who hold fast to the Father of mercies who has comforted you in your affliction so that you can comfort others, and not the ones who shallowly quote Romans 8:28. If you’re grieving or coming alongside someone else in their grief, I would love to pray for you. You can leave a comment, or, if you’d rather, you can email me at cynthiafin@gmail.com. As I sat in the Friendly’s parking lot feeling sorry for myself, I began a journey to discover who I really am. Not who I think that I am. Not who others say I am. But who I really am. I discovered that I am created in the image of God. There is no condemnation, no separation, and my labor is not in vain. I am brought near, built up, a daughter of the King, and lavished with all the incomparable riches of God’s grace. I am created in the image of God, and I have a hope and a future. And, I discovered something amazing. I discovered that that as we fix our eyes on Jesus, he does something absolutely amazing. Through his word and by his Spirit, he transforms us from the inside out. from one measure of glory to another. Little bit by little bit, as we learn to center our life around Jesus, as we saturate ourselves with his word, as we choose to walk in his ways, he transforms us into the women he created us to be. Now it’s your turn. Over the coming days, look up these jewels. You could take one each day and let the truth wash over you and permeate your heart. One by one, underline them, highlight them, write them in your journal, post them on your refrigerator, memorize them, and whisper them over the other women in your life. Fix your eyes on Jesus. He authored your faith. He’s perfecting your faith. And he wants you to know that he created you in his image for Kingdom purposes that will bring glory to him, blessing to others, and so much joy to your own soul. Discover who you really are and join me in becoming a dangerous, joyful band of holy women. What, in your life, threatens your identity? What has helped you discover who you really are? Add to the conversation by leaving a comment below. Or drop me an email at cynthiafin@gmail.com. Or connect with me on Facebook. I’d love to hear from you! As a young mom I sat with my six-month old daughter, in the parking lot of Friendly’s. Inside the restaurant my husband and friends celebrated a birthday. When we planned the evening, I knew it would be pushing it to bring the baby along, but we didn’t have money for a sitter, and I hoped it would be okay. The waitress brought our menus, and the baby began to stir. I put my pinky in her mouth to see if she would drift back off to sleep. That worked for a little bit, and I ordered my meal. But sometime between placing my order and it arriving, the baby decided that enough was enough. Nothing worked. Not my finger, not a pacifier, nothing. Walking, patting, jiggling, burping … nothing worked. She needed what only I could give her, and she began to let everyone know it. I could’ve nursed her right there in Friendly’s, but it would have made the non-dads around our table uncomfortable. Call me cowardly, but I packed up our stuff and headed out to the car. I felt unknown. We had left NC where I had been running with my circle of friends for years. They knew my family history, my degrees, my accomplishments. Now Bill and I were in MA where all of that meant nothing. I felt alone. Although I had friends, I was the only mom in the bunch. Getting out and going was just too exhausting, too hard, too much. I felt alone … isolated. And I felt uprooted. Labels I had used to define myself no longer applied. I wasn’t a graduate student, or a camp counselor, or much of anything, it seemed. I felt uprooted. to discover who I am, I began to search the Bible to see who God says that I am. I’ve found that these identity questions tend to surface during seasons of transition. This searching was kicked off for me as I transitioned into motherhood. Are you in a season of transition right now? Into the marketplace, marriage, or motherhood? As things are “shifty” around you, are you asking questions like, “Who am I, really?” What scripture or Biblical truths have you found to be helpful as you wrestle with identity question? Email me at cynthiafin@gmail.com, leave a comment below so that others can join in the conversation, or connect with me on Facebook. Come back on Wednesday and we’ll dig in deeper. I’ll share words that God sang over me, and wants to sing over you as well as I learned how to root my identity in Christ. If you are popping over from Knowing God Ministries where I’m guest posting today… Welcome! So glad you’re here! If you are a regular reader, I’m so thankful for you! Over these past months I have LOVED the emails you have sent me, the messages on Facebook, and when your friends show up and tell me they landed here because you told them about this site. Thank you! I started this blog back in 2008 when our family hosted a little girl, Katya, from Ukraine. So many people were curious why we, a family with six kids, would welcome an orphan into our home for four weeks. They became more curious when we decided to pursue adoption. In 2009, we welcomed Katya into our home, not as an orphan we were hosting, but as our daughter. … my purpose with this blog has changed through the years. Rather than simply give readers a window into our family life, now I want to raise up a battalion of women who will pursue Christ and his purposes at all cost. You are a woman created in the image of God and I want to help you discover what that really means. I want you to experience the joy of knowing who you are, and whose you are. And I want to celebrate with you the beauty of who you are, and who you are becoming. Jesus cares about having a relationship with you. He’s not so concerned with your religious activity. I’ve found that many women need help in knowing how to have a deep and vibrant relationship with Christ. I want to come alongside you, provide you with tools, and help you set aside religion in favor of relationship. Before the foundation of the earth was laid, God established good work for you to do. This work was designed by our so very creative Father for his glory and your JOY. When you find the intersection of your spiritual gifts, your passions, your abilities, your personality, and your life experiences, you’ll discover your sweet spot. That place where you can say with Eric Liddell, “I feel God’s pleasure.” I want to help you get there. Over these next days, I’m going to take these three themes one-by-one and dig deeper. I want to show you more of what I’m talking about and why identity, intimacy, and impact are vital. Sound good? So, Knowing God friends, welcome! Thanks for popping over! If you like what you’re reading, stick around for a while, share with your friends, and let’s join hands to become a battalion of women who will pursue Christ and his purposes at all cost. I would LOVE to get to know not only Knowing God friends, but all of you, whether who are a subscriber, a regular, or just landed here for the first time. Although you are always welcome to email me at cynthiafin@gmail.com, I would love it if you would leave a comment today and just tell me a little bit about yourself … your passions, where you are in life, and, if you’d like, what was meaningful for you in this post. Can’t wait to hear from you! I read on Saturday that Edith Schaeffer had died. I was sad, but so happy to read in the Huffington Post of the beauty of her last days through they eyes of her son Francis. I “met” Edith Shaeffer in the same way I met many of my mentors. Through her books. In September 1996, Bill and I caught a plane for the West Coast for a “Church Planting Assessment.” Right before we left, I popped into our church’s library and picked up this book. Before you dismiss the book based upon what seems like a very old-fashioned title, let me tell you that this book is not about cooking, cleaning, chore charts, laundry, and household organization. Rather, it’s about instilling the everyday with beauty and fellowship through music, and art, and food, and gardening. The premise is simply that our God is creative. And he created us in his image. Since we are created in his image, we will also experience joy when we create. And here’s where the one super-practical great idea I learned from Edith Schaeffer comes in. As we flew from the East Coast to the West, I not only caught a vision for worshipping with children, but I learned how to engage my children during the sermon rather than teach them how to simply be still and stay quiet. While her husband, Francis, preached, Edith sat with her children and illustrated the sermon. Here’s a picture from Hidden Art of Homemaking from her granddaughter, Elizabee’s, notebook. a white heart to show when a person has accepted Jesus. But, maybe it would be easier to show you a real-life picture of a sermon I helped Katya with in September. The sermon was from Matthew 5:9, “Blessed are the Peacemakers.” The point of the sermon was simply that we cannot be peacemakers unless we are at peace with God. With Katya, I often write questions for her to answer. Then I draw an illustration on my paper. She draws an illustration in a way that makes sense to her. Like I said, I’m not nearly as artistic as Edith Shaeffer’s. But, it works. Actually I think it does more than works. I think this is a super-practical great idea that is valuable for at least seven reasons. It keeps your kids engaged. They love to see what you will draw. It keeps you engaged. If you have a child waiting to see how you are going to illustrate the sermon, you have to pay attention. It provides a way for you and your children to review what they have heard. It helps you learn how to get the main point out of a sermon. Your pastor will love it. 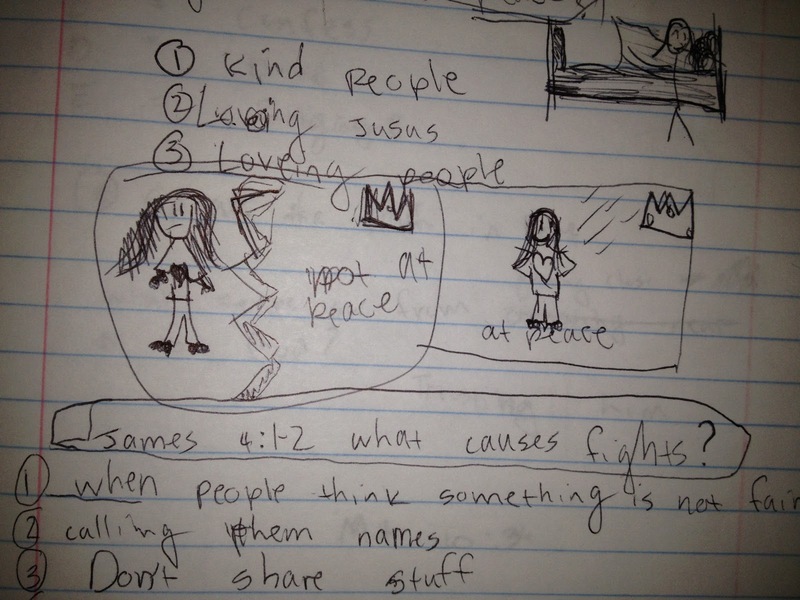 Bill loves to see how the kids and I illustrate his sermons. I’m guessing your pastor would too. It provides a meaningful keepsake for your kids. Really more than a keepsake, it helps you to mark spiritual milestones and maturing faith. If you have several kids, as the “olders” grow up, they can do this with they “youngers.” This helps you out and they stay engaged as well. There was much more to Edith Schaeffer than her sermon-note-drawing ability. She authored 18 books, was a literary dynamo, didn’t worry what people thought of her, and was a steadfast lover of the arts. She’s one of my heroes and I’m still learning from her. Illustrating sermons for my children was one of Edith Schaeffer’s super-practical great ideas I put into practice. Do you think it would work for you? If you’ve read The Hidden Art of Homemaking, I’d love to hear how it impacted you. Or, if this post stirred any other questions or thoughts, please leave a message or email me at cynthiafin@gmail.com. And you know I’d love to connect on Facebook or Twitter.